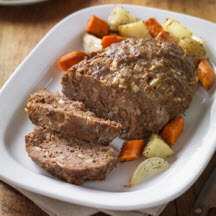 CooksRecipes has quality, kitchen-tested recipes for beef meatloaf that you can count on for successful deliciousness. The ultimate comfort food—meatloaf. Easy, delicious and feeds a crowd on a budget. Hot out of the oven, this moist and flavorful meatloaf is what comfort food is all about. Makes a terrific sandwich the next day, too! The aroma alone of this flavorful meatloaf and the root vegetables roasting is enough to gather the family eagerly around the supper table.